The weekend box is a fantastic subscription box available over at weekendboxclub. 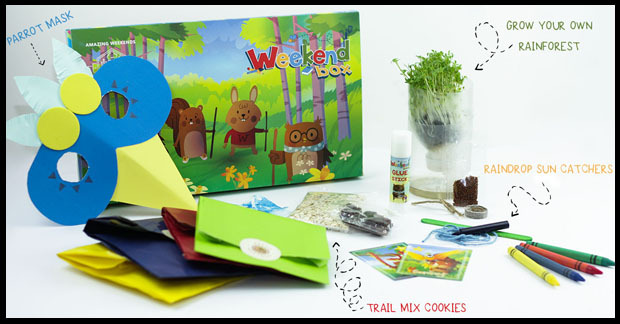 It is an activity box designed for children aged 3+ to get creative over the weekends with 4 different activities to have fun with. 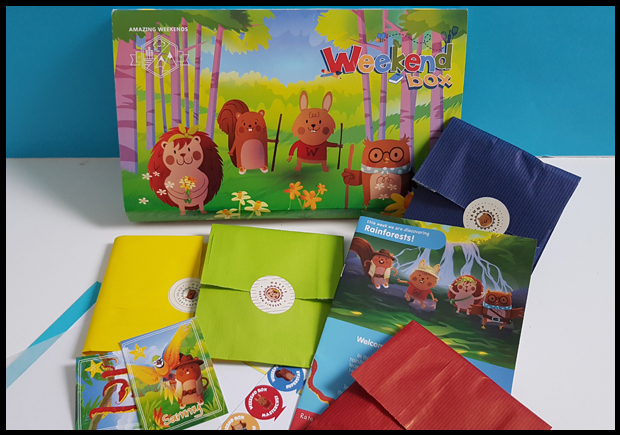 The rainforest pack, which is the box we recently received is usually the first box a new subscriber will receive and a great introduction to the work weekend box do. There are four activities in the box and each activity is owned by an animal, to make the box that little bit more fun and engaging for the children. Each box will contain a cooking activity of some sort, this box had cookies. As you can see from the picture below, the ingredients are supplied in Wooster's red envelope, along with detailed instructions within the magazine. 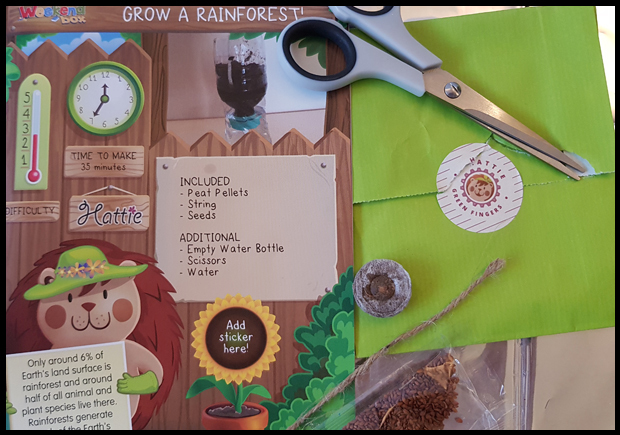 Whilst this one may be a quick 30 minute craft, it has lasting effects thanks to the seeds which come within Hattie's green packet; and don't worry if you're not green fingered, we just have to follow the instructions in the book. This envelope is great for children who want to make, and after all this box is all about crafting. I can't free draw a mask, so it's perfect this box comes with such a template. 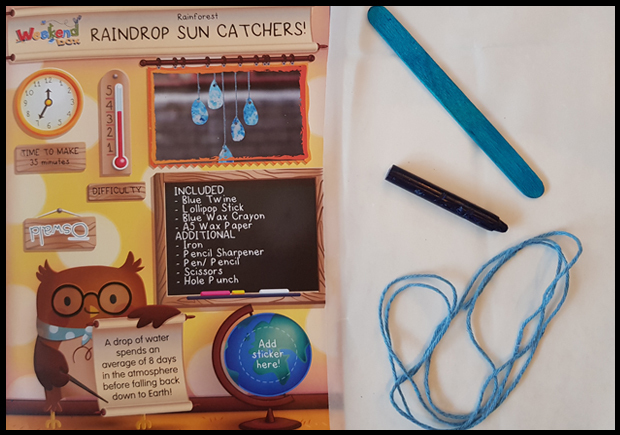 In the rainforest box, Oswald guides us on how to make sun catchers, along with the instructions you'll also notice little words of wisdom that Oswald holds up. I love that the box fits through the letterbox, so there is no delay in getting started with our crafts. I also like that everything is portable. Such that if you are going out for the day, you can grab one of the envelopes and the booklet and have a craft to hand. 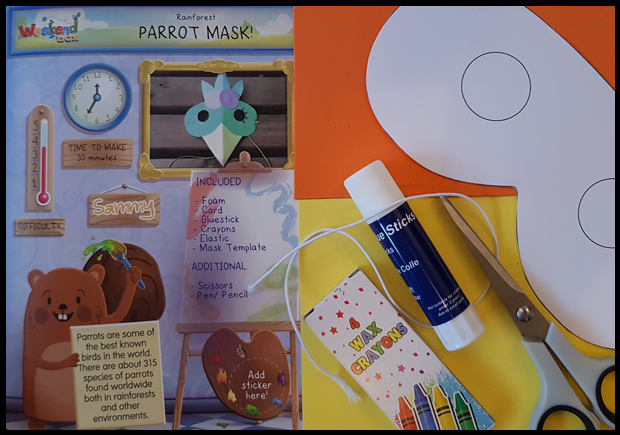 The instructions are very clear, some activities need adult supervision or help, especially with cutting, but the majority of the instructions can be completed by the child themselves. There are 2 types of boxes to purchase. Mini boxes currently cost £5.95 per month and come with 2 activities. Bumper boxes come with 4 activities and cost £8.95 per month. These are ideal little craft boxes especially for those who are not that crafty or know what to do with children when they want to create, or if you are limited on space and don't have craft supplies at home, with the the right quantities supplied in these boxes there is no issue with storage. 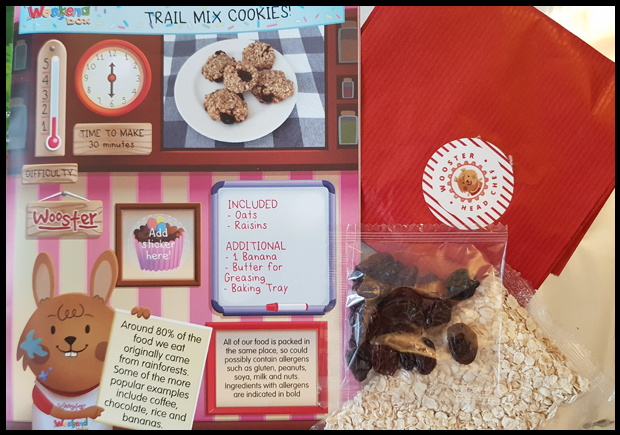 The link above to Weekend Box is an affiliate link, but will also allow you to get your first mini activity box for free or the bumper box for £1. A great offer to get you started don't you think?